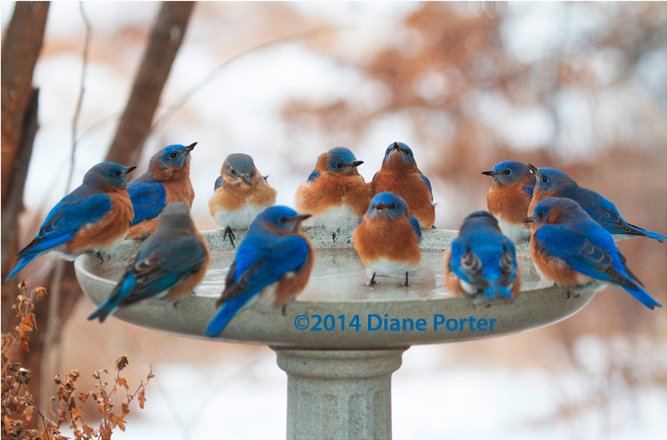 One of the things I love best about winter is the bluebirds coming to the Kozy Spa Bath. I took this picture in my Fairfield, Iowa, back yard on a February morning. One morning it was minus 16 degrees! 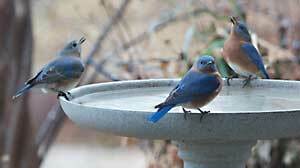 And when I looked out my window in the dim dawn light, I saw birds already getting a drink of water. That's when I took the photo below of our Kozy Spa birdbath. Some ice and snow were built up around the edge of the bath, but there was still unfrozen water that the birds could get at. 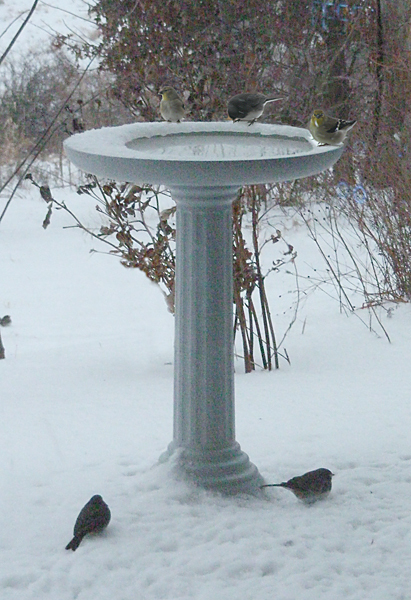 The goldfinches and juncos were all over it. At one time there were 20 birds getting a drink at one time. Water is scarce when it's that cold. I think they really appreciate being able to find water. What I love about this birdbath is what you don't see! I really like what this bath doesn't have. The pedestal is hollow, so you can run your electric cord right up through the center of it, out of sight and protected from weather and mishap. It plugs right into the bottom of the bowl. You can't see it, because the pedestal covers the connection. There's a small opening at the bottom to accommodate the cord where you run it to the bath from your electricity source. Inside the bowl there's an invisible heat source. Because its sealed inside, it's more durable and dependable than old-style heated baths. Birdwatching Dot Com is in a very windy location. I mean, we have gusts that move sheds if they aren't secured to the ground. After you put the cord through the Pedestal and get the Kozy Spa situated and level, you can fill it partway with sand, to help keep it steady. We were afraid it still might blow over, so we first pushed a 3-foot piece of rebar into the ground (or a stick would have worked), and we placed the pedestal over it. Just insurance. Then we added a bucket of sand. It was easy to put in through the hole in the top of the pedestal. I don't know if the rebar was necessary, but we've had some terrific howling winds during the night, and the bath has stayed upright and level for over two years now. But the Kozy Spa bath by itself is really lightweight and easy to handle. The pedestal is 23" tall. It's engineered of the same durable polymer construction as the bowl. It's much easier to clean than most baths, because there's nothing in the way. Just squirt or swipe out bowl and refill. I like to clean a bath every day or two, for the health of the birds, and this bath makes it easy. I also like the fact that it's on a pedestal, so I hardly even have to bend over to clean it. It looks graceful and elegant. I can't say I've ever had a bath that I liked the looks of better. See my goldfinches enjoying, at right? I'm planning to use my Kozy Spa bath even when winter's over. P.S. There's also an economical unheated version of the same bath, for bird lovers who live in areas that seldom freeze. You'll find it described here. And you can order it here. There's another version, the Kozy Resort, that refills itself whenever the water level drops. See Kozy Resort. on choosing birdbaths, bird feeders, binoculars, or other birding products.